Last Day for CTMH Boxing Week Savings! Have you been taking advantage of the CTMH Boxing Week savings going on this week? This is your opportunity to save on Cricut bundles, photo albums, cardstock, stamp pads, and reinkers! Today is the very last day of the sale, so make sure to check out all of the goodies marked down up to 40% off for today! Click here to save. As 2017 comes to a close, you can be ready for 2018 by creating a beautiful photo calendar. The Through the Year calendar kit includes everything you need to create a 12-month photo calendar for the year ahead. Save 20% on this exclusive bundle of products, that includes custom gold glitter die-cuts, glitter gems, Complements, papers, and a blank calendar. The November Stamp of the Month, Through the Year, makes an excellent companion to this project, too. If you didn’t get this limited-time stamp set last month, never fear — you can get a calendar kit that includes this set! Get this exclusive calendar kit FREE this month when you sign up to become a Consultant in December or when you host a qualifying party. You can also choose a Fundamentals Bundle FREE when you become a Consultant in November or when you host a qualifying party! Get this D-size Stamp of the Month set, featuring 17 stamps, for only $5 with a minimum qualifying purchase! Full details here. Adorable, and just in time to make cards for Valentine’s Day! The CTMH November Stamp of the Month: Through the Year, features 28 versatile stamps that are just perfect for any layout, card, or project where months are needed! This D-size stamp set is available from November 1 – 30, 2017 only. You can purchase it outright for $17.95, or purchase $50 or more in any Close To My Heart products and get it for only $5! You can view the entire stamp set here. It’s time to celebrate National Stamping Month! The exclusive From the Heart card kit gives you all the materials you need for creating 12 interactive cards, including an E-size stamp set with heartfelt sentiments and stamps you can layer together for exquisitely artistic cards. Available only during September, this card kit is a must have that will help you create elevated artwork from the heart. The From the Heart card kit can also be yours for FREE when you become a Consultant in September or when you host a qualifying party. Contact me for further details. Get this D-size Stamp of the Month set, featuring 9 stamps, for only $5 with a minimum qualifying purchase! Full details here. August is a great time to host a gathering or Facebook party, and earn even more Hostess Rewards from CTMH! When you host a party (virtual or in person) in August that reaches at least the third level of Hostess Rewards, your rewards will automatically “jump up” to the next level—which means extra rewards and even extra 50%-off items! A night with friends and a chance to earn free products — get all that and more when you host a Close To My Heart gathering or Facebook party! Earn discounted or free products based on the total of all orders collected as part of your party. And, we’ll pay shipping and handling on all of your Hostess Rewards. Read on to find out more about the rewards you can earn! Get 50% off the price tag of one item when you reach level 2 of Hostess Rewards; earn additional 50%-off items the higher your party total goes! Choose from higher-ticket items like our Cricut® collections as well as a collection of items available exclusively to hostesses, like our Workspace Wonder™ Hostess Bundle! To schedule your own gathering or Facebook party, contact me today! Which Ink Should I Use? If the words pigment, dye, archival, and permanent ink have you confused, you are not alone! But don’t despair… deciding which ink to use is easy when you match it to your specific project. In the latest Close To My Heart blog post called, 13 Tips for Becoming an Ink Expert, there are various tips and tricks to using specific inks for your projects, and a few ways to use your ink pads that you may have overlooked. 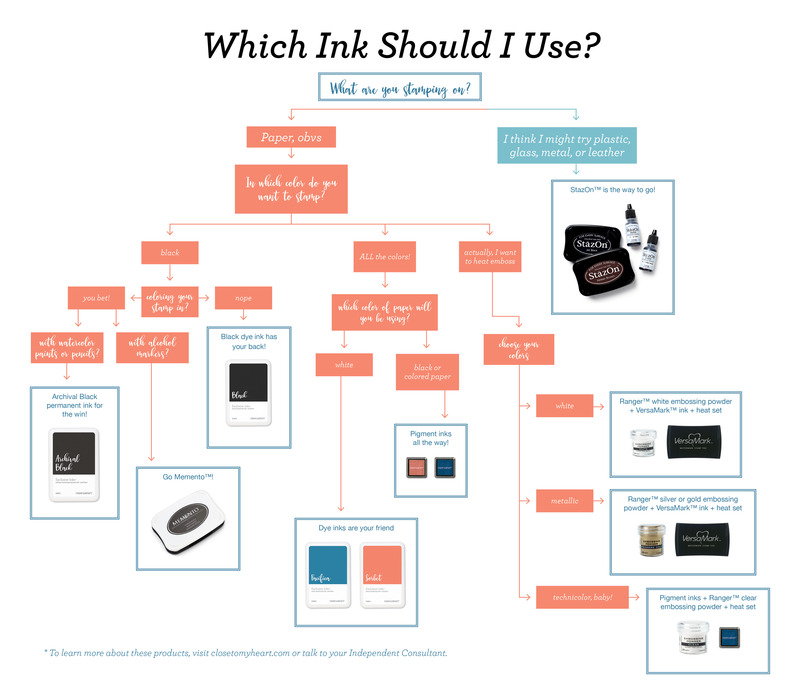 My favorite part of their blog post was the Which Ink Should I Use? Infographic. Take a look at the chart below and never doubt your ink choices again. So, the next time you bring out your watercolors and wonder which are the best inks to produce a crisp, clear image and prevent bleeding of your colors, you will know! You can check out the entire range of the Close To My Heart Inks and Coloring products right here. The CTMH July Stamp of the Month: Storybook Alphabet, features 26 versatile stamps that are just perfect for any layout, card, or project where letters are needed! This D-size stamp set is available from July 1 – 31, 2017 only. You can purchase it outright for $17.95, or purchase $50 or more in any Close To My Heart products and get it for only $5!